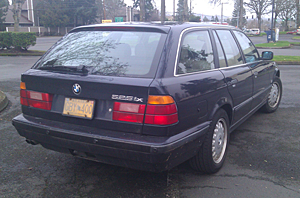 BMWs 1992-1995 E34 5-Series station wagon, known as the Touring, is common enough. If you want one, they’re out there. Prices will depend on condition and modifications, since most of the cars were heavily optioned. Stock 525iT with a slushbox or supercharged M3-powered 5-speed track monster? Sure. What do you want to pay?